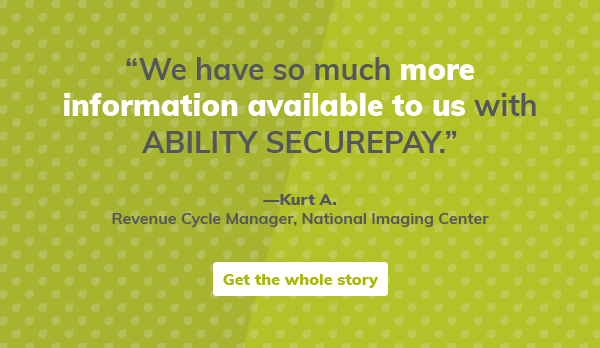 ABILITY SECUREPAY is a comprehensive patient payment platform that enables you to accept all forms of payment. With payment options at the point of service, online, via automated payment plans, card-on-file, over the phone, and by mail, patients have the flexibility to use their preferred payment method at any point in the revenue cycle. On the back end, business office features help you post, refund, manage and track payments, work more efficiently and automate many time-consuming tasks. See how this suite of web-based tools can help you dramatically improve your cash flow and staff efficiency, and reduce your accounts receivable by up to 18 percent. Connect to all of your ABILITY applications via myABILITY, a SaaS-based platform that provides you with access to applications you need to solve your most pressing administrative and clinical challenges. Whether you need RCM, clinical management or performance improvement support, ABILITY can help your financial, billing and overall operations work more effectively and efficiently.